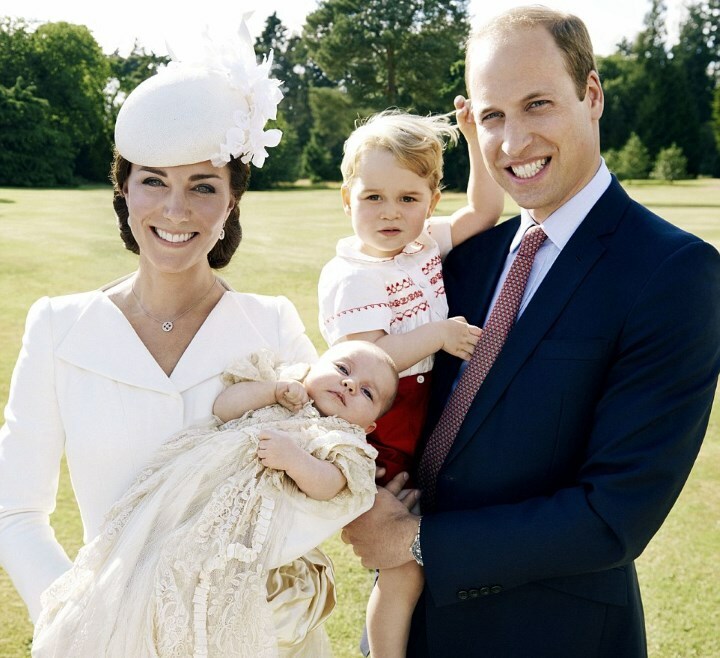 family photo of the Duke and Duchess of Cambridge, Prince George and Princess Charlotte. Photo: Mario Testino. Source: Kensington Palace Twitter feed. The christening photos of Princess Charlotte of Cambridge are out, and they are adorable mementos of a happy day of tradition and faith, followed, appropriately, by a tea reception. The little princess was christened on Sunday, July 5th, and officially named Princess Charlotte Elizabeth Diana of Cambridge, at St. Mary Magdalene Church at the Queen’s Sandringham Estate in Norfolk, where the baby’s parents, William and Catherine, the Duke and Duchess of Cambridge, have their family residence, Anmer Hall. While the path through the estate’s woodland to the church from Anmer Hall was lined with well-wishers, inside the church only family was allowed, including Charlotte’s great-grandparents, Queen Elizabeth II and Prince Phillip, her grandparents Prince Charles and Camilla, Duchess of Cornwall, and Mr. and Mrs. Middleton, her aunt and uncle, Pippa and James Middleton, and her five godparents and their spouses. Her uncle Prince Harry was in Africa and unable to attend. Now that summer is here and those delicious summer fruits are in season, it’s time to stock up on homemade jam for the tea party pantry! San Jose’s history as “The Valley of Heart’s Delight” is no longer visible in the orchards that once covered the Santa Clara Valley, but plenty of local people still have fruit trees in their front and back yards, full of ripe fruit this time of year. Wild plums and berries can also be found along the banks of rivers, creeks and streams in the Santa Cruz mountains and local foothills, if you know where to look. For those that don’t have edible landscaping at home, and even for those that do, the local farmers’ markets are a wonderful source of fresh, ripe fruit for tea-table jams and preserves. What better treat to serve your tea guests, give as gifts, or enjoy by yourself than homemade jam? It’s not as hard as it seems. Plus, once you’ve washed the fruit, you can freeze it in freezer bags, and make jam or pie with it later in the year (or when the weather has cooled down a bit). Tea tasting equipment at Red Blossom Tea Company in San Francisco. Photo: Elizabeth Urbach. Downton-inspired tea for “Downton Day”. 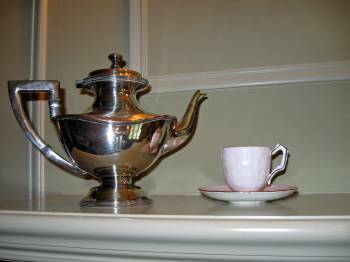 1920s silver teapot and cup and saucer on display at the Ainsley House in Campbell, CA. Photo: Elizabeth Urbach. Today is the last “Downton Day” of the year – the final episode of Downton Abbey Season 5 airs tonight on KQED/PBS at 9 p.m. Pacific time. This season’s plot has brought the Crawleys and their servants into the mid-1920s, and nobody’s lives are settled and secure, as usual. What better way to catch up on the doings and happenings in this fictional world than with a cup of tea and some treats at the ready? Look in the tea party pantry for some English tea-time favorites, like scones (you can use a mix or buy them ready-made), cream, jam, and cakes. 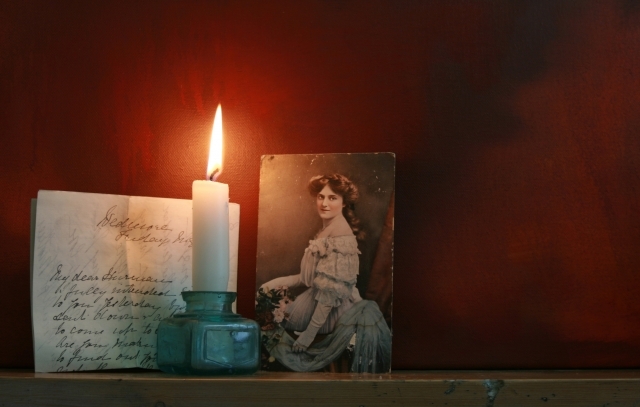 You can make an elaborate spread suitable for the Dowager Countess, or a simple tea table that would make Mrs. Patmore and Mrs. Hughes, or Lady Rose’s Russian refugees comfortable. All the Single Ladies (and Gentlemen) – enjoy Singles’ Awareness Day with tea! Have tea at a local tea shop (advance reservations required). 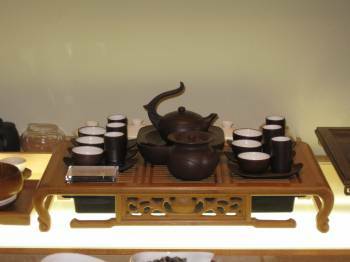 Tea with Love (through Feb. 28th), for $28.95 per person at Lisa’s Tea Treasures – Los Altos: 167 Main St., Los Altos, CA 94022. (650) 209-5010. Be my Valentine Tea (Feb. 14th only), for $35 per person at Satori Tea Bar – 37 San Pedro St., San Jose. 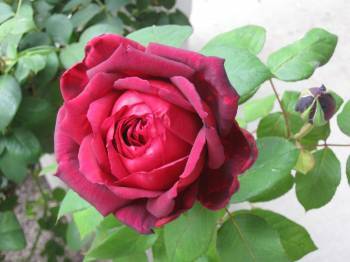 A Victorian Valentine Tea Party (Feb. 14th at 3 p.m.), for $30 per adult/$20 per child, at The English Rose Tea Room — 163 West Neal Street, Pleasanton California 94566, (925) 462-6233. 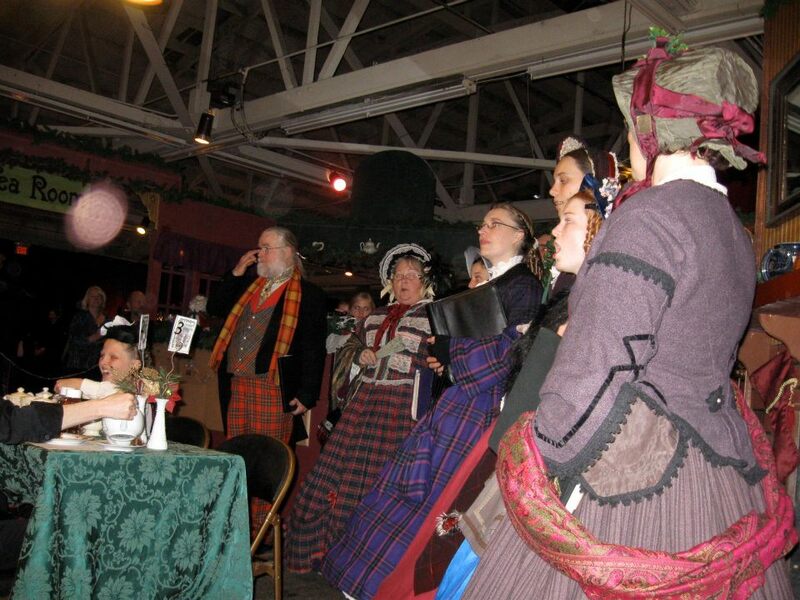 Last chance this weekend for tea at the Dickens Fair! 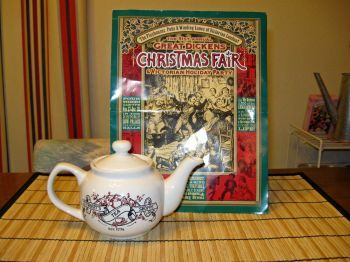 Brochure and complimentary teapot from High Tea at Cuthbert’s Tea Shoppe. Photo: Elizabeth Urbach. Beat the heat with iced tea punches and cocktails. 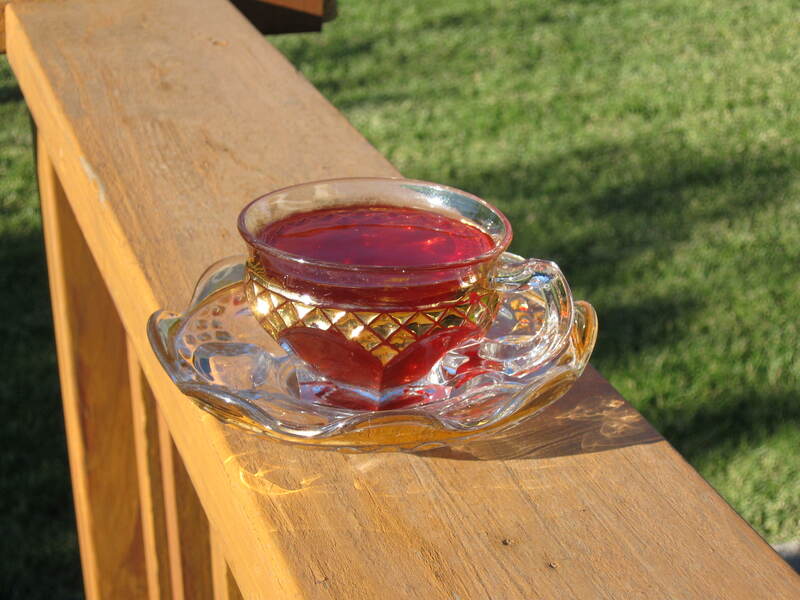 Pomegranate tea punch. Photo: Elizabeth Urbach. With the beginning of summer comes the perfect weather for a refreshing glass of iced tea. Although there is no reason to become bored with good old iced tea – because of the wide range of flavored teas commercially available – tea can be used to make many other cold beverages, both alcoholic and non-alcoholic. Alcohol-free beverages include punches, virgin cocktails or “mocktails”, spritzers, and of course, the ever-popular Arnold Palmer — iced tea and lemonade mixed together in equal parts. 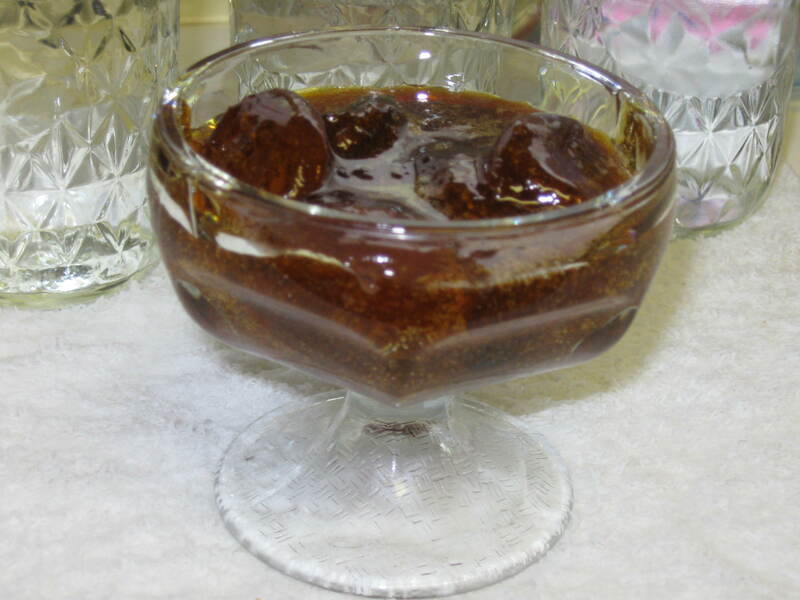 It is one of my favorite ways to drink iced tea in the summer! You can also add things like rose water, orange flower water, and simple syrups flavored with mint or other herbs, orange peel or other fruits to your iced tea for more variation. Then, there are the alcoholic punches and cocktails that contain tea; there are so many options! 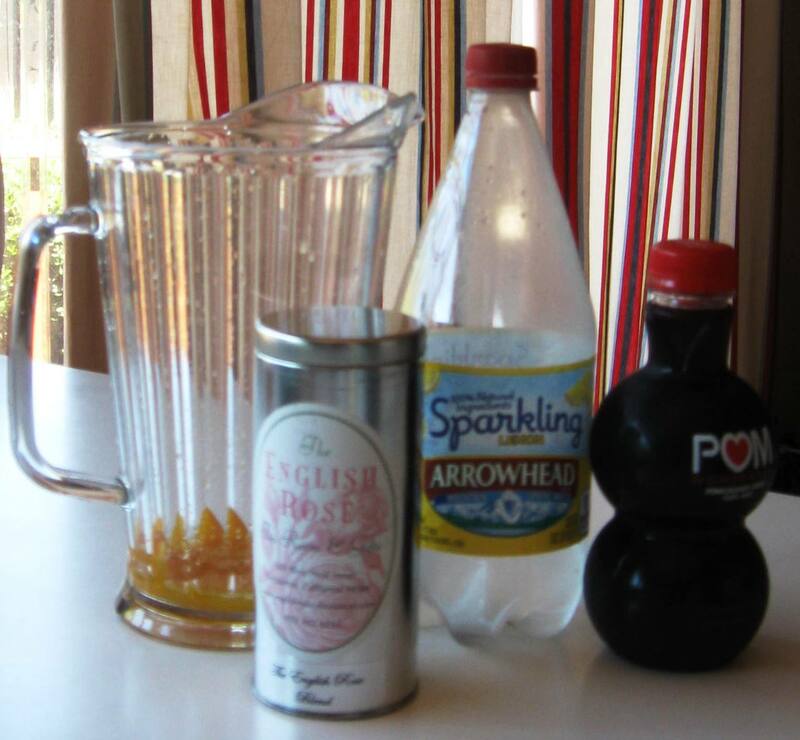 Here are two great tea punch recipes. The first one was served by the South Bay Ladies’ Tea Guild at their Pre-Raphaelite Tea Salon a few years ago. It has remained popular with them and their guests ever since. Raise your teacup to Charles Dickens’ 200th birthday. The Coventry Carolers at Cuthbert’s Tea Shoppe. The popular Great Dickens Christmas Fair and Holiday Party, which opened the weekend before Thanksgiving this year, is in extra celebratory mode, remembering the 200th anniversary of Charles Dickens’ birth. Born February 7, 1813, Dickens created some of the most iconic stories and characters known to Western literature, which are brought to life at the Dickens Fair in Daly City at the Cow Palace. Actor Robert Young portrays the author every year and conducts readings of his works throughout the six weekends that the Fair is open. The fair is open from 10 a.m. to 7 p.m. through December 22nd.